The case you choose to house your gaming computer’s components will play a large role in the overall quality of your system. A solid case offers good support for your components and it will also aid in the cooling process of your system. So, when choosing the parts for your gaming computer, it’s important that you make sure you spend your time choosing a quality case. Even if you’re on a budget and you’re building a cheap gaming computer, you can still find a solid case for your system. There are many different factors to consider when choosing a case for your system. In this post I will go over three things that you should consider when purchasing a case for your gaming computer. There are a few different sizes of computer cases you have to choose between. All of them serve different purposes. There’s the standard ATX size, which is the typical tower size for most computers. This is a good size for pretty much any application. The full tower case is larger than the standard ATX cases, and it offers more room for upgrades, more storage bays, and superior cooling options. The full tower case brings a lot to the table and is perfect for high-end systems. However, you need to make sure you have plenty of room for a full tower case as their size can make them difficult to place. In addition to the full tower case, there’s also the Super Tower case. Super Tower cases are even bigger and badder than full tower cases. However, they’re also a lot more expensive. I only recommend going with a Super Tower case if you have a huge budget. If you’re looking for something a little bit smaller, you can always go with a micro-ATX case or a mini-ITX case. These cases are a lot smaller, which means achieving adequate cooling and utilizing high-end components is more difficult. However, their small size makes them more portable, which makes them perfect for LAN-party gamers. For those who do choose to go with a smaller case, make sure that you choose components that will fit inside of your case. Ultimately, the size of the case depends on your own specific needs. One of the most important things that you should consider before building a high-end gaming computer is that you need to ensure your system has adequate cooling. Heat is the bane of all electric components, and you need to make sure that your system stays at optimal temperatures. One way to achieve this is to choose a case that is designed with cooling in mind. With good airflow going through your case you can rest assured that your system will stay cool, thus operating in an efficient manner. Pretty much all cases come with at least a couple of fans. However, a quality case will come with multiple fans and will give you the option to install more, too. 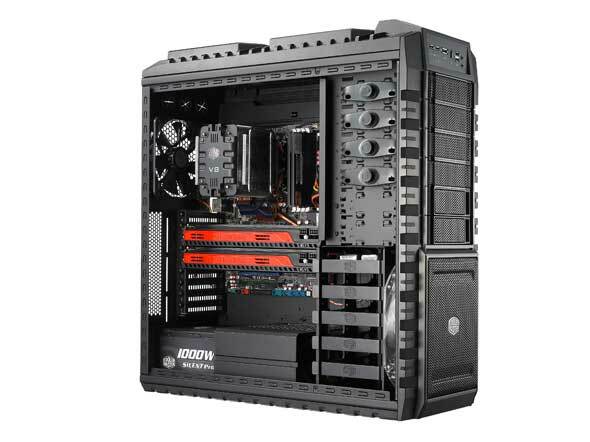 The Cooler Master HAF X, for instance, comes with four fans, including a large 230mm fan on the front of the case, and two good-sized 200mm fans on the top and side of the case. And, the larger the fans, the more air they can push at lower speeds. This provides both better cooling and less noise. The HAF X is just one example of a case that offers superior cooling. 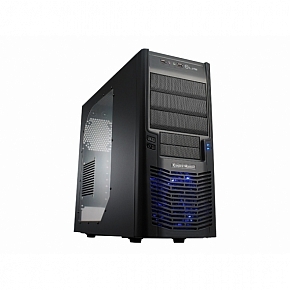 There are a number of cases available that will give you optimal airflow. However, the better a case is at keeping your system cool, the more you can expect to pay for it. In the end, though, a cooler computer will last longer and perform at a higher level. So, the extra investment in a case that runs cool will be more than worth it over the long run. The more sturdy and well-built your case is, the better protected your fragile components will be against the elements. For the most part, computer cases are typically tucked away in locations to where they can’t be harmed. However, that doesn’t mean that they aren’t susceptible to being damaged. And, the cheaper the case you choose, the more likely it is that your system will be damaged should the case be struck, dropped, or hit. Fortunately, there are certain cases that are designed to be a lot more sturdy and durable. Yes, you will have to pay more for a well-built case, but since it’s going to protect hundreds or thousands of dollars worth of computer components, a solid case is definitely worth the extra cost. Most cheap cases are built out of low-quality metal or plastic. These cases are more likely to be seriously damaged if they are dropped, hit, or struck. And, damage to the case could result in damage to your system. On the other hand, a quality case will be made of steel, industrial grade plastic, or a combination of both. Cases built with these materials are much stronger and more durable. And, with their better build quality, they are much better options for housing your computer components. Most gamers will choose their processors and video cards before they choose the other components in their system. This is understandable, because those components will determine how powerful of a system they get. However, without a solid case to protect your components and to help keep them cool, you will put your new high-end gaming computer at risk. So, when looking for components for your gaming computer, make sure you spend some extra time choosing your case. That way, you can ensure that you case is better protected against the elements. Prev:Sandboxie 4.02 – Now with Full 64-bit Support!! Brent is a long time PC gamer and computer-building enthusiast. While he does enjoy playing his favorite PC games, he actually enjoys making upgrades to his computer so that it performs better than playing the actual games themselves. Brent is the owner of Elite Gaming Computers - a site dedicated to helping PC gamers make informed decisions on their gaming computers and hardware. His goal is to help users and gamers through the building process so that they can enjoy the satisfaction that comes with building their own system. A good, heavy case is also a lot quieter.